New Delhi, 18th January, 2017 – Panasonic India today announced the launch of its new Bluetooth sports earphones - RP- BTS50. The all new power-packed RP-BTS50 marries together uncompromising sound quality and portability with an aesthetic design, waterproofing technology and safety lighting. The model is specially designed to be the perfect training partner for individuals whether they are working out at a gym, cycling or running. The earphones have a round-the-ear 3D-Flex Hanger which is a perfect facilitator for exercising and can be freely bent, providing a comfortable and optimal fit whilst not inhibiting your quest to burn calories. The BTS-50 also comes equipped with a Bluetooth function that eliminates cable hassles. The embedded blue LED lights on the edges of the earphones give an attractive look and are perfect to provide security to runners during night. 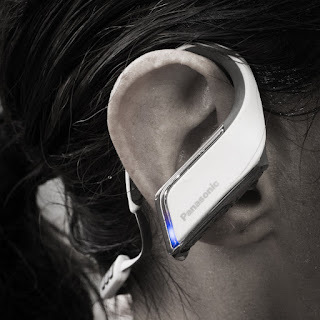 The IPX5 which protect earphones from sweat & heavy showers. The RP – BTS50 headphones comes with a flat cable which helps in reducing tough and sharp noise. The 12mm driver is compatible with aptX and AAC which can be removed. With amazing battery backup - a short 15 mins battery charge, can be used up to 70 minutes – these headphones are built to last a marathon.